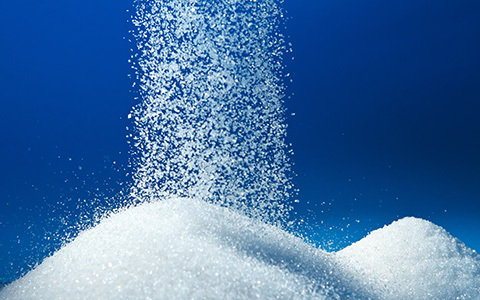 Hundreds of tonnes of specialist additives have been agglomerated for multinational food suppliers. 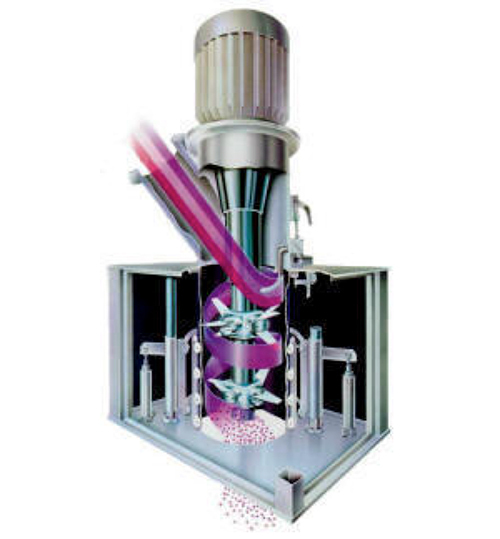 The exact dispersion properties required by customers are achieved by precise process controls and unique mixer configurations. Pharmaceutical excipients have been agglomerated with complex liquid systems in order to provide material for tableting. 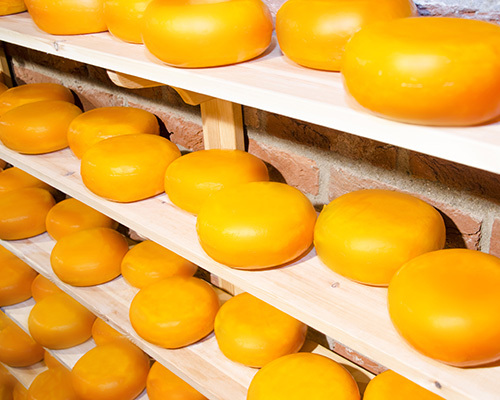 Production suites in both The UK and the Netherlands conform to FSSC 22000 requirements. 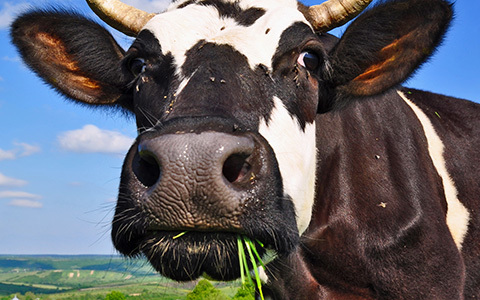 To date there has been no production of wet agglomerate Animal Health products. We were asked to do this by one company but we recommended a lower cost process which successfully delivered the required product characteristics. Another happy customer. Wet agglomeration is available to Veterinary Medicines Directorate specification on request. Hundreds of tonnes of specialist chemical additives were agglomerated at short notice in order to overcome a capacity crisis for a customer. We have more than 10 years of experience in high shear agglomeration of low density powders with high levels of liquid addition in order to generate precursors for personal care products. We have successfully spray dried and agglomerated specialist surfactants which were impossible to dry by traditional tower dryers. We have achieved continuous agglomeration of hundreds of tonnes of chemicals for the detergent industry. 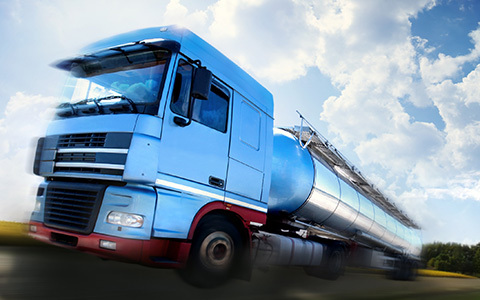 Customer supplied liquids were received in heated bulk tankers which we maintained on site for the duration of the campaign. Powders are usually received in big bags. This is very versatile equipment capable of wide ranging fine adjustment to achieve results which exactly meet your requirements. Based in the Helmond (NL) factory there is a continuous agglomeration plant with the ability to run either of the high shear mixers, the twin screw extruder or the pellet press, or in-fact a combination of two of these machines. On continuous processes accurate dosing of all components of the formulation is essential. This is achieved using self-auditing loss in weight feed systems. 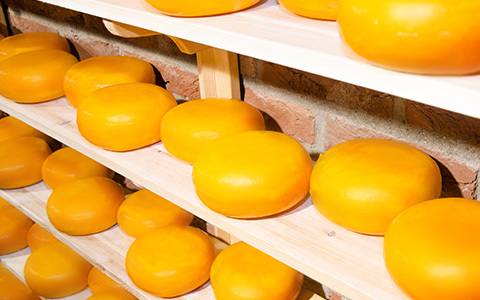 Once agglomerated, material can be dried or cooled in a continuous fluid bed drier. Material then passes out of the dryer to a 2 deck sieve. Oversize and fines can be recycled continuously to the process or packed separately, while product is being packed to big bags. Powder falls past high speed rotating blades on a vertical shaft. Adjustment of blade angles and rotation speed can change the mixing profile. Liquid is dispersed into the powder mix via internal air atomised nozzles. The liquid can be either water based, a non-volatile oil, or a melted wax. Residence time within the mixer is short, typically less than two seconds, thus there is little time for liquid to absorb into a powder. As the level of liquid is increased, agglomeration occurs, and the wet granulate falls out of the mixer. The mixer has a self-cleaning system based on a flexible wall which constantly breaks any wet material away from the wall. Depending on the feed materials the dried product is typically 400 to 800 kg/m3 bulk density and between 200 and 1800 microns particle size. Tighter distributions are possible through selection of the sieve sizes prior to packing. Sometimes referred to as a pin mixer or ring mixer. In the Loedige CB30 powder travels horizontally through the mixer. A horizontal high speed rotating shaft with pins and shovels both mixes the powder and transports it through the mixer. A weir controls the fill level and residence time in the mixer thus the energy or mixing input. Residence time in the mixer is still relatively short (seconds not minutes) and so it is better suited to low levels of liquid addition. Liquid can be added from the shaft through liquid addition pins, or from nozzles in the wall of the mixer. Dispersion is only via the mechanical action of the pins thus it is typically not as uniform as the Schugi. The energy input in this mixer can be far higher than the Schugi, thus more dense, robust agglomerates are possible. Two counter rotating screws draw powder into the horizontal mixer barrel. The configuration of the screws inside the barrel generates an intimate mix of powder and liquid and can impart significant energy to plasticise the mix. The barrel of the extruder can be heated to enable binding by melted components of the formulation, or liquids can be injected. 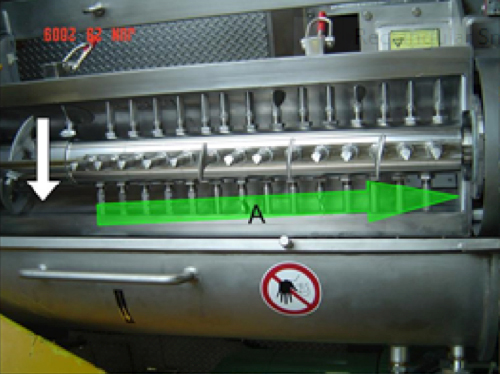 Product is then forced through a die producing a noodle like structure. Die sizes are typically from 1mm to 10mm. The spaghetti like extrudate is either chopped or breaks under its own weight to the desired length before drying or cooling. 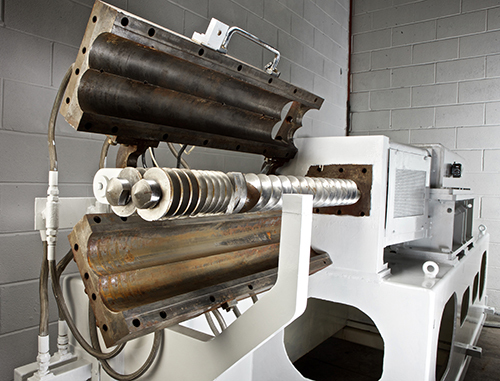 The pellet press uses friction and pressure through a rotating die to form pellets, typically between 2 and 6mm diameter and from 6 to 15mm long. 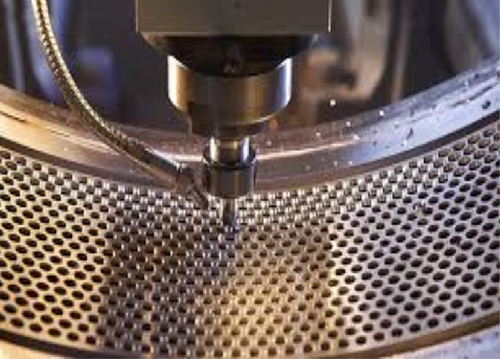 The machine can work with melt binders or water based binder systems. For water based binder systems continuous pre-blending is possible prior to feed into the press. 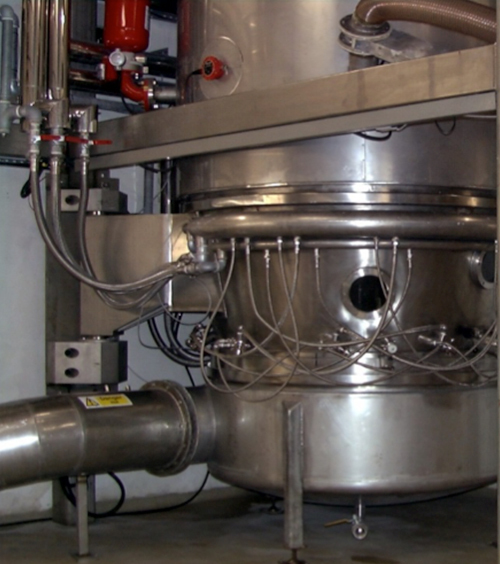 With melt binders it is normal to pre-blend in batch blenders such as ribbon or ploughshare blenders. Die selection is critical to successful pellet formation and is sensitive to the formulation. The thickness and profile of the die controls pressure hence friction input into the material. The balance required is to achieve just enough pressure to form a pellet which is then robust enough to be cut as the die rotates past a stationary cutter. 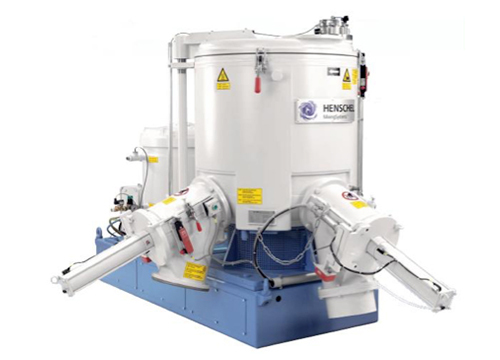 Based on a Henschel mixer this machine can agglomerate small batches of powder by the mechanical action of the mixer blades situated in the bottom of the mixer. Liquid or melted wax can be poured or injected into the moving powder mix thus dispersion is by the mechanical action of the mixer. The speed of rotation of the blades and power input controls agglomeration. This mixer is capable of putting significant energy into the powder being blended, sufficient to disperse and melt powdered wax binders. Two batch fluid bed driers are available at the Crewe (UK) site. Typical batch sizes are 1000 to 2000ltr for the large fluid bed and 100 to 200ltr for the small unit. The large Huettlin fluid bed agglomerates by sub surface spray. Powder is conveyed into and out of the mixer by vacuum transfer. The specialist design of the Huettlin system allows processing of cohesive powders that are not normally possible to handle in a fluidised bed, it also permits high precision coating of even fine powders with or without agglomeration. Batch fluid bed agglomerated products tend to be lower density and are sometimes more friable than the continuous agglomerated equivalents. The advantages of this process are that far higher liquid input is possible and the integrity of any coating can approach 100%. The small Glatt fluid bed agglomerates via top spray liquid addition. Powder is vacuumed into the drier, agglomerated and then discharged by vacuum convey system. Fines are retained within the Glatt by a cartridge filter system.